What Keeps Food from Going Down Your Windpipe? Sometimes food goes down the wrong way and enters the windpipe and then the lung, rather than the esophagus, giving you a choking feeling. Fortunately, there are certain structures within the mouth and throat that can prevent this problem. Then exactly what keeps food from going down your windpipe? This article will describe the complex process of swallowing and the structures of the throat that keep food traveling down the esophagus rather than the windpipe. The windpipe, also known as the breathing tube, is very close to the esophagus, the tube used to swallow food. At some point, there is a branching off of the trachea from the esophagus so that air goes down the windpipe and food or drink travels down the esophagus. The split between the two structures occurs near the place of men's Adam's apple. How is it possible that food and drink know which direction to go and what keeps food from going down the windpipe? There are three parts to the mechanism of swallowing: the first is the oral phase, in which the food is located in the mouth. The second is the pharyngeal phase in which the swallowing reflex is triggered, allowing for passage of food past the throat and into the esophagus. There is a structure, called the epiglottis, which closes off to prevent food from going down the windpipe when swallowing. The third stage happens when food and drink are actually passing through the esophagus in order to enter the stomach. So the epiglottis, a leaf-shaped structure, is what keeps food from going down your windpipe. It is attached to the front part of the thyroid cartilage. When you breathe, the epiglottis is pointed upward so that the underside part of the structure is part of the pharynx. When you swallow, the hyoid bone is elevated and the larynx goes up, folding down the epiglottis so it is in a horizontal position. 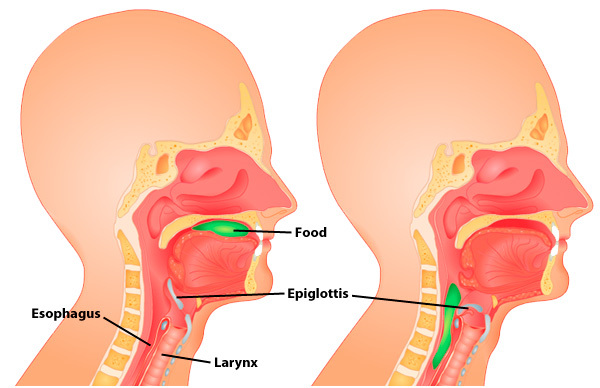 The superior aspect of the epiglottis is part of the pharynx in that situation and causes food to travel toward the esophagus and away from the trachea. If the epiglottis doesn't close the way it is supposed to, this initiates the gag reflex, which causes you to gag and cough up the wayward food. Can Food Go Down the Wrong Pipe? Food can indeed go down the wrong pipe. Under normal circumstances, the epiglottis closes properly and food goes down the esophagus. If the epiglottis doesn't close the way it is supposed to, food can accidentally get down inside the trachea as you swallow. If you have a decent immune system and a good cough reflex, there is no problem with this happening and the food is coughed back up. If not, you can inhale food into the lungs, which is known as aspiration. There can be serious complications from food entering the lungs, especially if this happens often enough. The main causes of aspiration are altered cognitive status that causes the gag reflex to become impaired. Drinking a lot of alcohol can cause the same problem. Other causes include gastroesophageal reflux disease, which can narrow the esophagus so that food is more likely aspirated. You know you have aspirated when you experience coughing, wheezing, shortness of breath or pain in the chest after trying to eat something. You may also cough up sputum that smells like rotten food. Tiredness, dizziness and bad breath may also happen. Food or liquids, when they get in your lungs, can cause an inflammatory response because the lungs aren't used to having a foreign substance in them. You may develop excess fluid in the lungs as well as an infection. One of the main complications is bacterial pneumonia. If you already suffer from emphysema or pneumonia, your risk of aspiration pneumonia goes up. Pneumonia is also a complication of aspiration among smokers, people with poor immune systems and the elderly. Your healthcare provider may be able to diagnose a case of aspiration pneumonia by listening to your breathing. Blood tests or tests of the sputum as well as chest x-rays, CT scans, and swallow studies can tell if you are at risk for aspiration or have developed aspiration pneumonia. The main treatment is antibiotics to help clear up the infection. If there is a large piece of food in your bronchial tree, the doctor may have to use a bronchoscope to remove the offending food particle. The epiglottis is what keeps food from going down your windpipe. Besides this, you can do some extra things to help prevent the chances of food going down the wrong pipe. You can avoid aspiration by taking little bites of food at a time and by chewing you food carefully when eating. Do not laugh or talk while you are chewing. If you keep suffering from aspiration, the doctor may recommend that you eat a softer diet or a diet consisting only of liquids. This will keep you nourished without causing aspiration. If you feel a pain when swallowing, feel a gurgling sensation upon eating, or feel as though something is getting stuck in your throat when eating, you may be aspirating. Seek medical attention if this is happening to you in order to prevent aspiration pneumonia. Why Do You Get Nausea from Not Eating? What Do Different Hernia Types Look Like?